Contact Rabner Baumgart Ben-Asher & Nirenberg, P.C. Rabner Baumgart Ben-Asher & Nirenberg, P.C. represents employees who have experienced intentional personal injuries at work in New Jersey and New York. These claims, which lawyers often call “intentional torts,” can cause serious physical and emotionally harm to employees. Below are some of the most common employment law personal injury claims that our employment law attorneys handle. Defamation is when someone makes a false statement of fact about you. For example, it can include false statements of fact made to the press or media, to your coworkers or to your family and friends. There are two categories of defamation: libel and slander. Libel is when the defamatory statement is written. Slander is when the defamatory statement is verbal. Libel and slander are both legally actionable personal injuries in both New Jersey and New York. One common forms of defamation in the employment law context relates to negative job references. Although there is some degree of legal protection for individuals who provide job references, they do not have the right to lie about you. Other situations in which workplace defamation can occur include a former boss spreading false information about the reasons you left your job, a coworker lying to your boss about your job performance, or the company making false statements about you to the press or media. Similar to a claim for defamation, the claim of false light occurs when someone makes a true but misleading statement of fact about you to someone else. For example, if someone truthfully states that you were never convicted for drug trafficking, it still might falsely imply that you are a drug dealer who was never convicted for it. Publicly portraying you in a false light can be legally actionable if it would be highly offensive to a reasonable person. 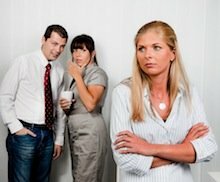 Tortious interference with an employment relationship is when someone wrongfully causes you to lose your job. For example, it might be legally actionable if someone who has a grudge against you calls your boss and tells lies that cause you to lose your job. Similarly, if you are fired because your former supervisor called your new employer because he is angry about the discrimination claim you made against him, you might have a claim for tortious interference as well as a retaliation claim. A similar concept is called tortious interference with prospective employment (or prospective economic advantage). It occurs when someone’s wrongful actions cause you to lose a potential job offer, such as by giving false or misleading information about you to a company that is considering hiring you. Intentional infliction of emotional distress occurs when someone intentionally engages in extremely hostile behavior toward you that causes you to experience severe emotional distress. The behavior has to be so extreme and outrageous that it goes beyond all bounds of decency. In addition, the emotional distress has to be so severe that you needed psychiatric counseling or treatment. Intentional infliction of emotional distress has some similarity to a claim for workplace harassment. Intentional infliction of emotional distress has to involve more severe conduct than is necessary to establish an harassment claim. However, unlike harassment, the intentional infliction of emotional distress does not necessarily have to be motivated by your age, race, gender or another legally protected category to be legally actionable. A workplace battery occurs at work if a coworker or supervisor physically injures you, such as by punching or kicking you. An assault is when someone attempts to batter you, but does not make contact with you. For example, if your boss throws something at you and it hits you, you probably have a battery claim. If your boss throw something at you but barely misses you, then you might have an assault claim. Claims based on lies and misinformation that cause you to accept a job offer. Please see our Employment Fraud and Misrepresentation page for more information. Claims based on your employer violating your right to privacy at work. Please see our Workplace Privacy page for additional information. If you have been the victim of an intentional workplace personal injury at work in New Jersey or New York, or if want more information about your legal rights, we can help. Please feel free to contact us online or call us at (973) 744-4000 to schedule an initial consultation. Rabner Baumgart Ben-Asher & Nirenberg, P.C. is located in Upper Montclair, NJ and serves clients in New Jersey and New York, including in and around Essex, Bergen, Hudson, Passaic, Morris, and Union counties, Bloomfield, Glen Ridge, Montclair, West Orange, Belleville, Nutley, Livingston, Millburn, Roseland, East Orange, Orange, Verona, North Arlington, Cedar Grove, Lyndhurst, Essex Fells, Harrison, Rutherford, Newark, Passaic, Kearny, South Orange, East Rutherford, Little Falls, and Caldwell.